Regardless of the efforts exhibited by today’s working professionals to guarantee the safety and security of our community, there will always be a series of risks and disasters creeping at every corner. This is why it’s crucial for officials to conduct a regular hazard vulnerability analysis to better understand the specific dangers facing citizens and businesses of a particular community. This will also help them point out the areas and facilities that are in jeopardy. You may also see case analysis examples. Identifying the natural and technological hazards faced by an organization or community is incredibly important for a number of reasons. So in this article, we’ll tackle the basic elements of a vulnerability analysis for you to learn more about. You may also check out here break-even analysis examples. 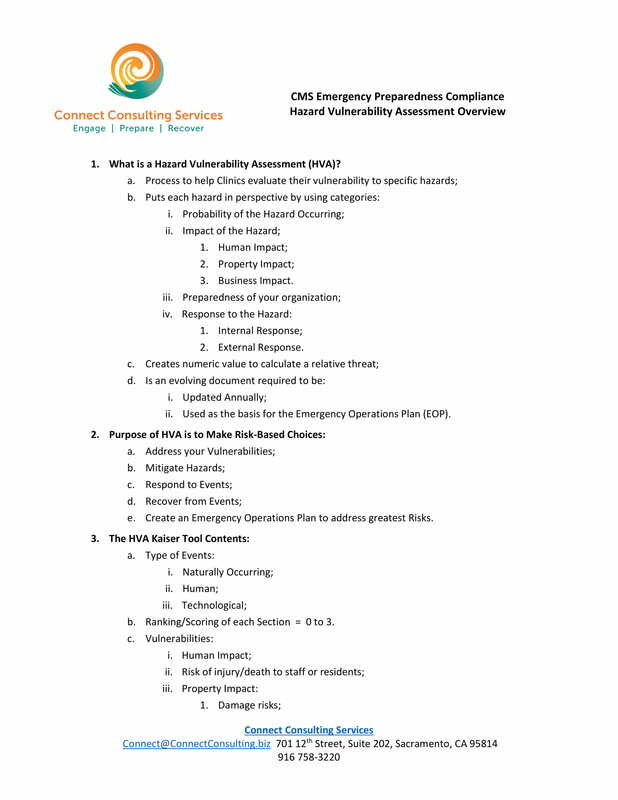 A vulnerability analysis is a thorough process of defining, identifying, quantifying, and prioritizing (or ranking) the vulnerabilities in a system. Some examples of a system for which a vulnerability analysis is performed include information technology systems, energy supply systems, transportation systems, water supply systems, and communication systems. In doing so, it provides the organization doing the analysis with the necessary knowledge, awareness, and risk background to grasp the threats to its internal and external environment and to respond appropriately. 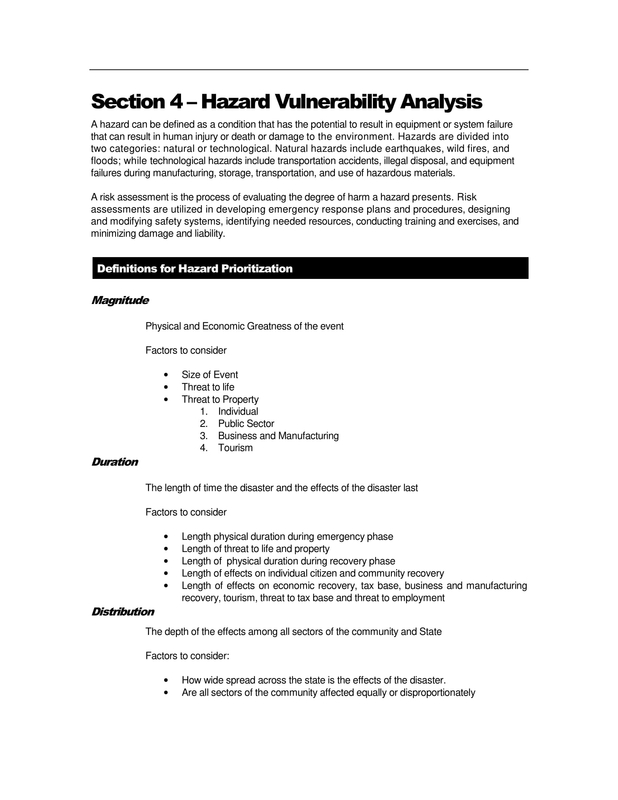 You may also see dust hazard analysis examples. A vulnerability analysis is usually intended to point out the threats along with the risks they pose against a particular circumstance. Many organizations, or even individuals, that face an alarming risk of cyber attacks can greatly benefit from a simple assessment, while much larger enterprises are subject to benefit from a comprehensive analysis due to the ongoing attacks that they’re most likely to face. That’s because security vulnerabilities enable hackers and other data thieves to access IT systems and applications with ease, making it critical for enterprises to recognize and rectify weaknesses before they may be exploited. With an extensive vulnerability analysis and management program in place, organizations can work to improve the security of their systems to prevent potential damage or loss. You may also check out here job analysis examples. Say for instance, viewing vulnerability from the perspective of disaster management, we understand that evaluating the threats from potential hazards to a population and to an infrastructure is vital due to its level of impact. This may also be conducted in various fields—be it political, social, economic, or environmental. Disasters occur frequently, some of which are caused due to natural calamities that are nearly impossible to avoid. This usually leaves a substantial burden on the affected population, often resulting in human, material, economic, or environmental losses or impacts. Rising from these disasters requires a significant amount of human and financial resources to recover, which can be a huge challenge if the affected population is already struggling economically. But it’s important to remember that a disaster is typically the product of a hazard and a vulnerability combined. Hazards that occur in areas with low vulnerability will not turn into a disaster thanks to several disaster management efforts. You may also see data gap analysis examples. Unfortunately, most hazards occur in areas that are highly populated, regions that are either developing or undeveloped, and places with poor infrastructure, and a limited or no disaster preparedness plan. If you think about it, nearly every location across the globe, specifically in third-world countries, have an increased likelihood of experiencing potential disasters. Compared to developed countries, such as the United States and Japan, where emergency planning and other disaster-related subjects have been studied and implemented, places such as China, India, and the Philippines may have disaster-related fields like disaster medicine education and research, but they’re all fairly new or outdated. The gap between the knowledge level and skills for disaster management and preparedness is something that officials must address before tragedy strikes. You may also see customer profitability analysis examples. 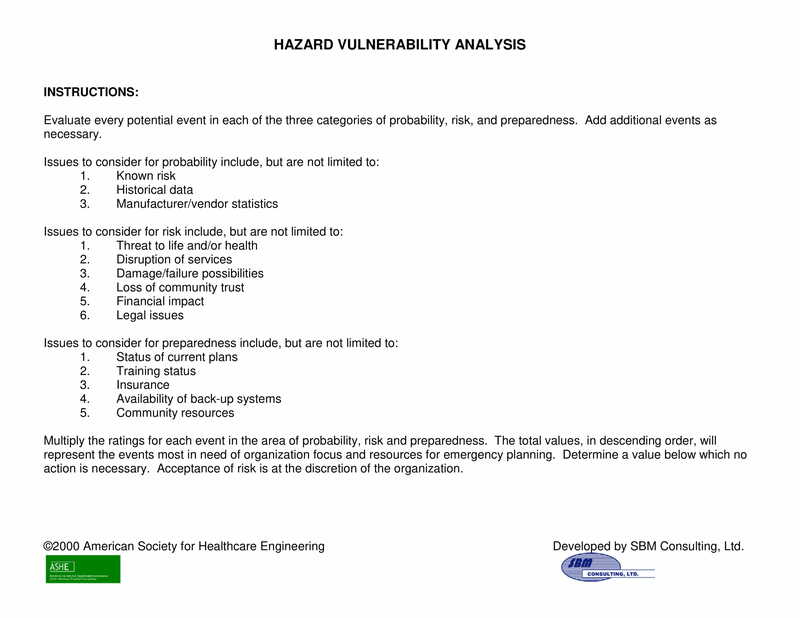 What Is a Hazard Vulnerability Analysis? 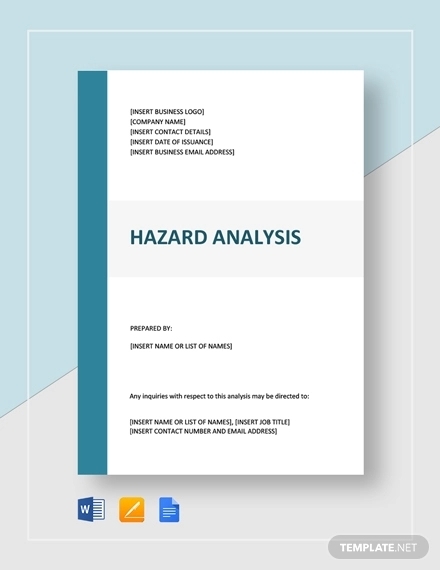 Now that we’ve discussed the significance of a hazard vulnerability analysis in the field of disaster management, let’s take a deeper look into what it actually is. 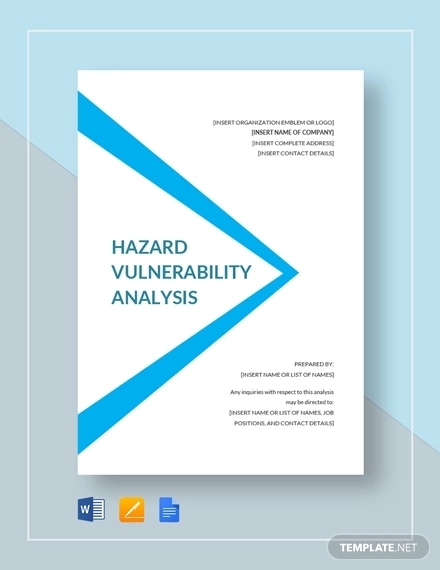 A hazard vulnerability analysis is a systematic approach employed to identify all potential hazards which may affect a particular population, to evaluate the risks associated with each threat, and to study the findings generated from the assessment to develop a prioritized comparison of the specified hazard vulnerabilities. This is often carried out at the community level or at the healthcare facility level. You may also see product cost analysis examples. In a healthcare organization, like a research lab or hospital, this process can assist the entity in identifying and preparing for impacts related to patient care, staff safety, facilities, and financial stability. 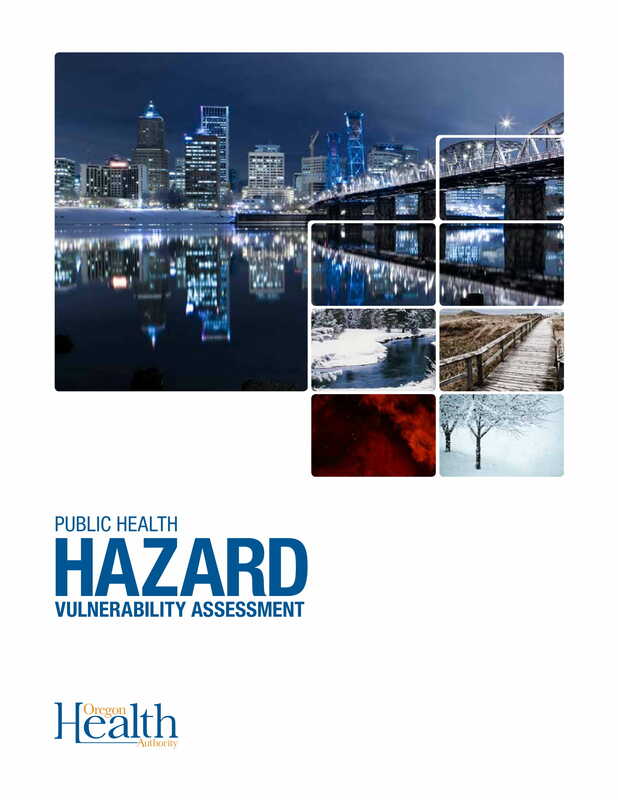 The hazard vulnerability analysis serves as a needs assessment for the emergency management program as well, as this can help the organization prioritize planning, mitigation, response, and recovery activities accordingly. A good example for this would relate to the events following the September 11, 2001 attacks in New York, where experts noticed the need for hospitals to function as an integrated entity within the scope of a much broader community. Since hospitals and other healthcare facilities are always considered as the first responders to disastrous events, they are now expected to be community organizations as opposed to standalone institutions. We rely on these organizations to treat disaster victims, provide healthcare to members of a community, and to prevent possible disease outbreaks caused by certain events, like the loss of infrastructure and/or poor sanitation. You may also see business systems analysis examples. If anything, a hazard vulnerability analysis serves as the key step in the emergency response to a disaster. This should help the organization examine the degree of impact of a particular disaster by providing background information to create a targeted disaster relief plan. 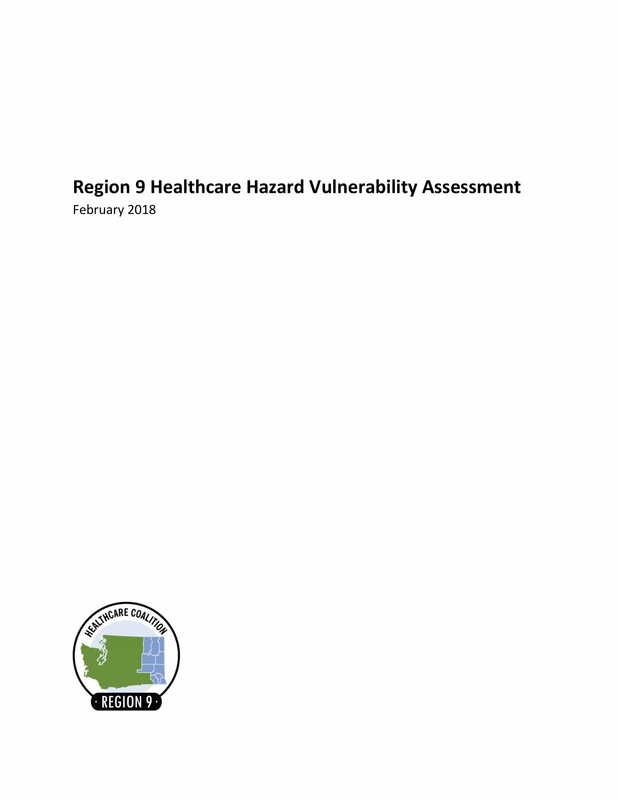 The different types of risks associated with the HVA include natural disasters, utility disasters, mass casualty incidents, industrial accidents, and weapons of mass destruction. 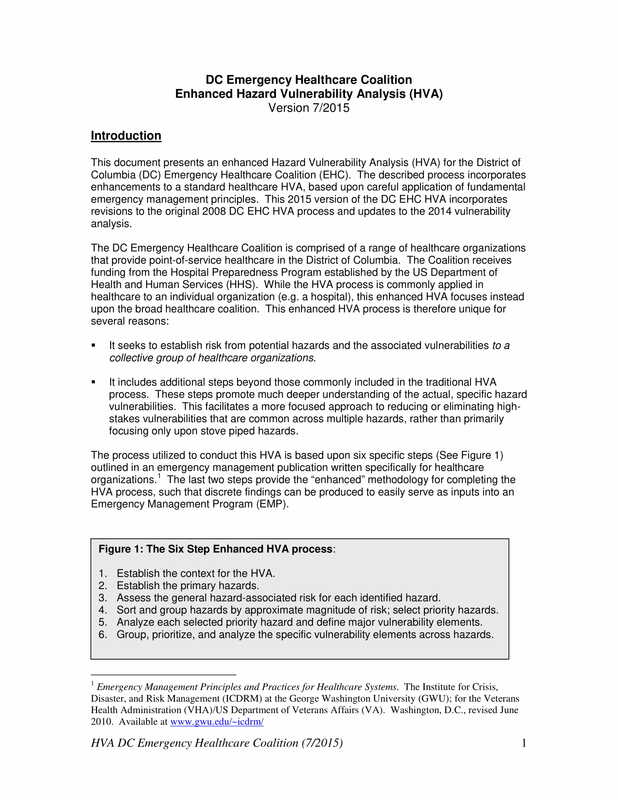 A hazard vulnerability analysis is often conducted on an annual basis in order to keep pace with changing conditions and turnovers in facility occupancies. 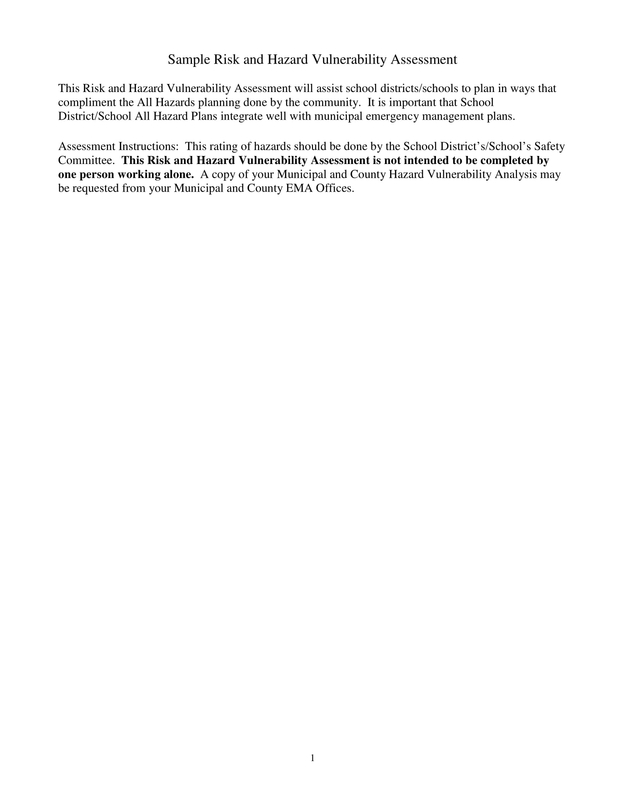 This will be used to assess all hazards, their risk of actual occurrence, as well as the impact on life, property, and business if the hazard takes place. The results indicated from the analysis report would then be used to develop mitigation, preparedness, and response actions in the event of a disaster. To perform a proper analysis, there is a certain procedure that must be followed to prevent any lapses in the development of your report. In the first step of the process, you must calculate the probability of a certain event. To do so, start by examining the risk, historical data, and the predictive data available. General risk – This may include a variety of factors, depending on the situation being evaluated. Anything from flood plain to the proximity to hazards or technology, and aging infrastructure may be classified as a general risk. Your team may also look into a series of hidden risks that may not have been identified during the previous assessment. This information can be acquired from the Federal Emergency Management Agency (FEMA), emergency management data, local health department, the internet, or even the yellow pages. Historical data – Gather relevant data on the history of the area being analyzed. This could be a history of flooding, drought, or even wild land fire. This data is often made available by the health department (local, state, and federal), the Federal Aviation Administration (FAA), the Environmental Protection Agency (EPA), and public safety agencies, just to name a few. You may also see event cost analysis examples. Predictive data – Thanks to the advancements in technology, it has become much easier for scientists and researchers to study the risks brought by natural calamities, such as earthquakes and hurricanes. This allows officials to foresee the potential risks brought by these elements to a community situated in a specific area. But this data should not be limited to the natural disasters that occur in our world, as terrorist targets can also leave a significant damage to the population. Fortunately, you can obtain this predictive data from the law enforcement (crime statistics), the local emergency management, the Joint Terrorism Task Force (JTTF), the National Oceanic and Atmospheric Administration (NOAA), the National Weather Service (NWS), and the local health department. Now that you have calculated the probability of an occurrence, it’s time to figure out the impacts of these events to the affected community. Human – To assess the level of impact caused by the disaster to the human population, you must take into account individuals with direct injury or illness, exposure or surveillance, as well as the fatalities from the said event. For instance, an earthquake strikes a city filled with skyscrapers and other corporate buildings. Due to its intensity level, building personnel will be forced to evacuate their offices immediately before a potential disaster occurs. When this happens, employees must be examined and tallied to see whether there were any casualties during the catastrophe. You may also see earned value analysis examples. Property – Property impact is another matter that officials must look into. This includes the impact on infrastructure, supplies and equipment, as well as transportation resources. The costs and expenses needed to compensate for these damages is just one of the things that officials need to worry about, as a damaged infrastructure or equipment is also vulnerable to other possible risks. So if a structure is marked unstable, then it is considered to be hazardous to the community. Business – Let’s say that a small town outside of Florida was struck by a tornado. Tornadoes are known to be vicious and merciless, so when a particular region is affected by its wrath, it’s bound to leave some devastating effects to whatever stands in its way. Businesses in the area are likely to suffer from its impact, especially when their stocks and office equipment or supplies are either destroyed by the flood or blown away by the wind. The impact brought by the disaster should then be assessed based on occupancy, record keeping, loss of revenue, and public perception. You may also see education gap analysis examples. Once you have determined the probability and impact of the hazard, you can now rank them accordingly, where a Low rating would mean that its occurrence is rare, Moderate for unusual, and High which indicates a high potential or a previous experience. For the last part of your analysis, you need to look into the plans, resources, and partnerships existing within the organization or community. 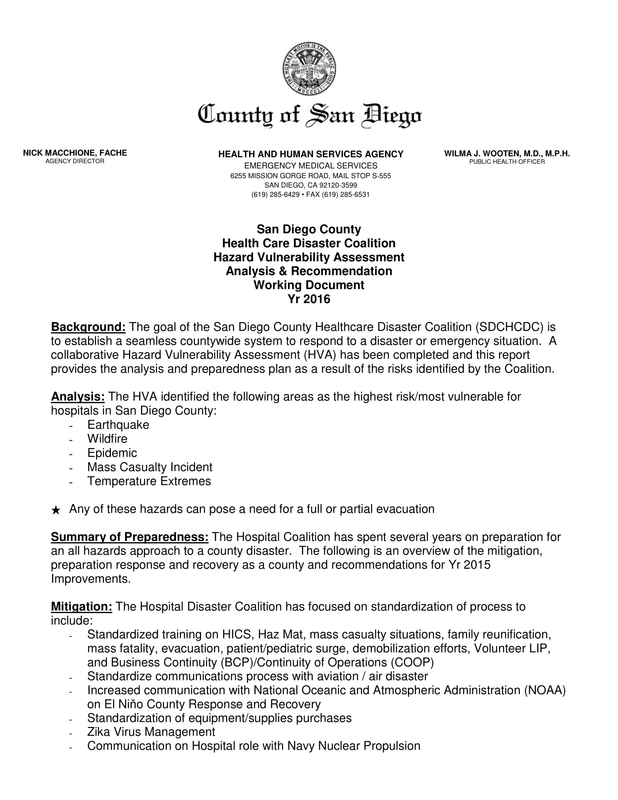 Plans – Take the time to review the organization’s existing emergency action plan, standard operation procedures, response guides, and task lists. This will make it easier for you to identify what is missing from these plans and how it may influence the proposed impact. Resources – This constitutes to both human and material resources. Your space, staff, and stuff are all classified as resources that must be accounted for during the analysis. To help calculate this, do your research on community assets, and seek for assistance from the military, various agencies, and federal response partners to formulate a better plan. Partnerships – In most cases, you would need the support from fellow businesses and vendors to get through the toughest challenges. Consider existing relationships, consortia, and memorandum of understandings when conducting this analysis. You may also see quantitative analysis examples. 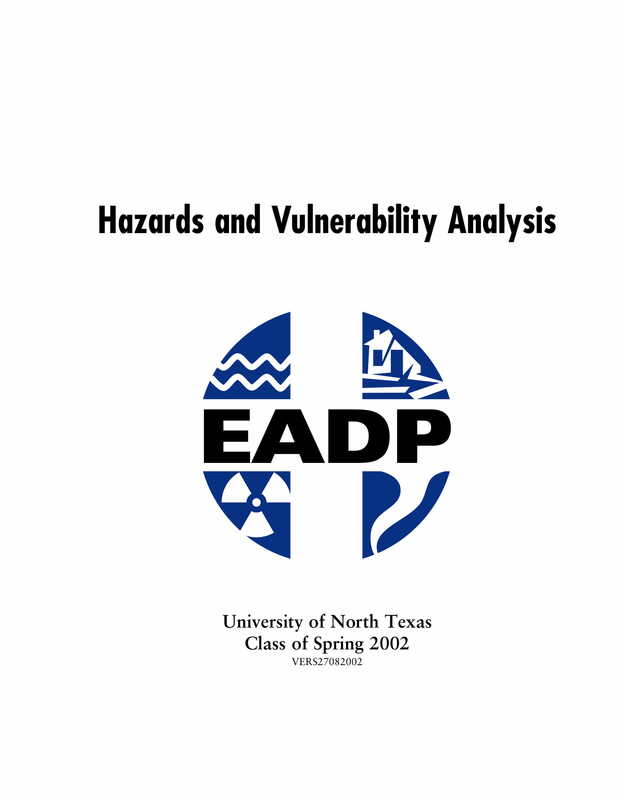 Ultimately, natural, technological, and man-made disasters are becoming more frequent in our modern society, which is why conducting a standardized hazard vulnerability analysis is essential in order to establish a robust emergency and disaster management program. This can help leaders identify key positions and their responsibilities; prioritize tasks; set plans for training, drilling, and exercising; and guide planning, mitigation, and recovery projects efficiently and effectively. 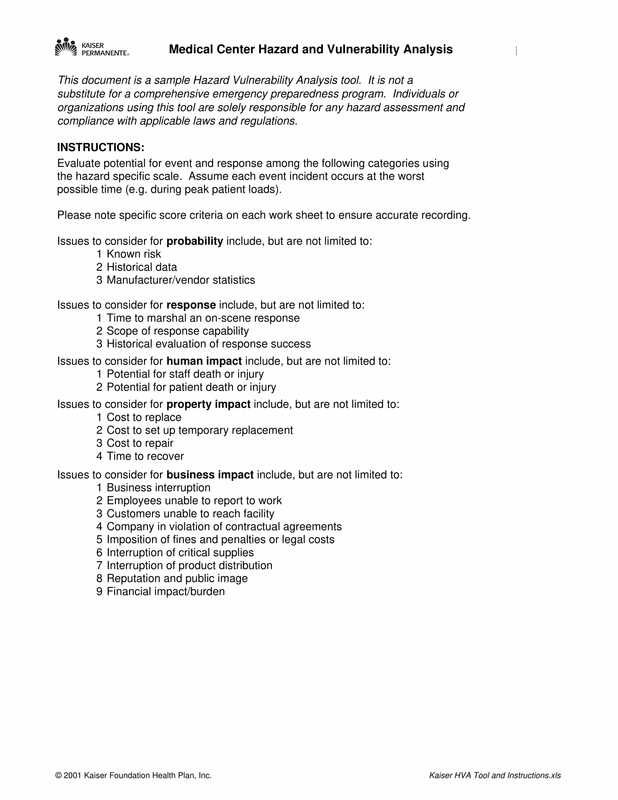 You may also see job safety analysis examples.